A 12-year-old girl suffered serious injuries Tuesday in a hit-and-run crash on an El Cajon street. 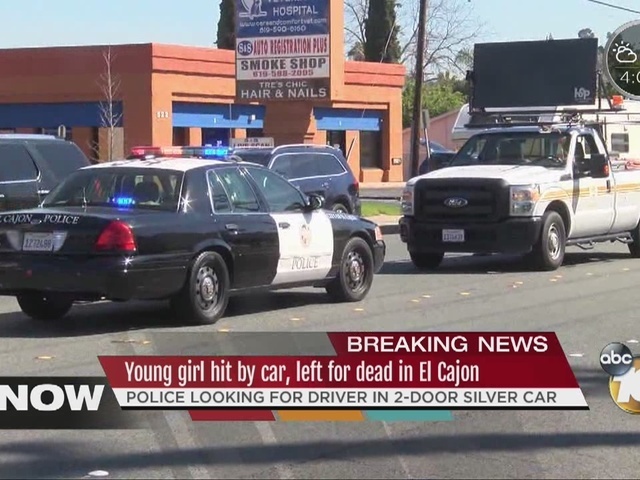 The girl was crossing traffic lanes in the middle of the 500 block of East Chase Avenue with two friends when a silver two-door sedan struck her shortly before 8:30 a.m.
"The involved motorist failed to stop or render aid at the scene of the collision and was last seen by witnesses continuing east on Chase Avenue," El Cajon police Lt. Randy Soulard said. Medics took the victim, whose name and age were withheld, to Rady Children's Hospital in San Diego for treatment of significant but non-life threatening injuries. Her companions were unhurt. A surveillance camera captured images of the car that hit the girl, the lieutenant said. The children were not in a crosswalk at the time of the accident, according to police. The El Cajon Police Department is asking anyone with information about the location of the vehicle or the identity of the owner or driver to contact them at (619) 579-3311.